Since the back of the Otway harp is covered with a modern plywood back cover, there is no way to find out the positions of the actual string holes, and therefore no way to find out the actual dispositions of the strings on the soundbox. Last year, Natalie Surina was inspecting and documenting the Otway harp in Trinity College. As part of this work she got permission to use an endoscope to look inside the soundbox through the tiny triangular cut-outs in the soundholes. She was able to note the ends of the nails which fix the brass strips on, and it was possible to collate the holes visible in the wood, with the position of the nails. I wondered if this evidence from inside, with the visible holes and nails, could be collated with the nail heads visible on the outside, to draw a kind of map of the holes and how they are hidden underneath the brass strip. I also looked at the first edition of Robert Bruce Armstrong’s book, which has extremely high quality photo-lithograpic images of the old harps. I was quite surprised to see that most of the brass strip was missing in his images. The strip we see now must have been fixed on after 1904. The underlined red numbers show where the strings are in Armstrong’s photos. I believe 17 is the highest hole where the hole in the metal lines up with the hole in the wood, but really I am guessing about the exact relationship between wood holes and metal holes. The red rectangle represents an inserted strip of wood, presumably repairing damage to the soundbox. This inserted strip is visible both through the endoscope inside, and on Armstrong’s photos of the exterior. Armstrong tells us that there are 35 string-holes in the wood, but I don’t think no. 1 is visible in either of Armstrong’s photos, or in Natalie’s endoscope. My numbering therefore runs from 2 to 35. It is possible that there is a hole high up that I cannot see. I don’t have a good modern photo of the top of the brass strip; I should check next time I am in, to see if hole 1 in the wood, is visible in the semicircular semi-hole 0 in the metal strip. In Armstrong’s photos, the brass strip is present in the bass, as far up as the join at hole 21. Above this there is no strip present. I wonder if the strip was removed, or fell off, at some point. I note the splits from metal holes 19 and 20, as if the string had cut into them – if the strip were mounted the other way around. I also note that the strips above hole 21 have very few nails, with little bumps imitating the positions of nails on the lower strips. Were the strips above 21 taken off at some point and folded up and stored inside the harp, to be found and replaced some time later? Or were these strips made new to decorate the harp in the early 20th century? Why do these midrange and treble strips not line up with the holes in the wood? The endoscopic view inside is not calibrated at all, and Armstrong’s photos are at funny angles and so can’t be easily measured. I don’t even know if an X-ray or CT scan would show the holes in the wood, because of the interference and shielding of the metal strips. I suppose that until the harp is conserved and/or repaired, with the back removed, we have no way of measuring the positions of these holes – I would think a calibrated laser-scan of the inside of the soundbox cavity would be the best way to measure their positions. This also means that none of the so-called replicas of the Otway harp made so far can possibly reproduce the string lengths and geometry of the original; and even a new replica taking these observations into account can only be approximate, until we have a way to actually image and measure the string hole positions. The holes in the metal can never have represented the actual string positions of the harp, since strings cannot be fitted to them – there is solid wood behind them! Thanks to Natalie Surina for discussing the interior views and for other information. Thanks to Karen Loomis for access to her first edition of Armstrong. My image at the head of this article shows a detail of the first edition photo-lithograph, showing the missing strip above hole 21. I notice from Armstrong’s photos, that there are pairs of nail holes aligned each side of every string hole. 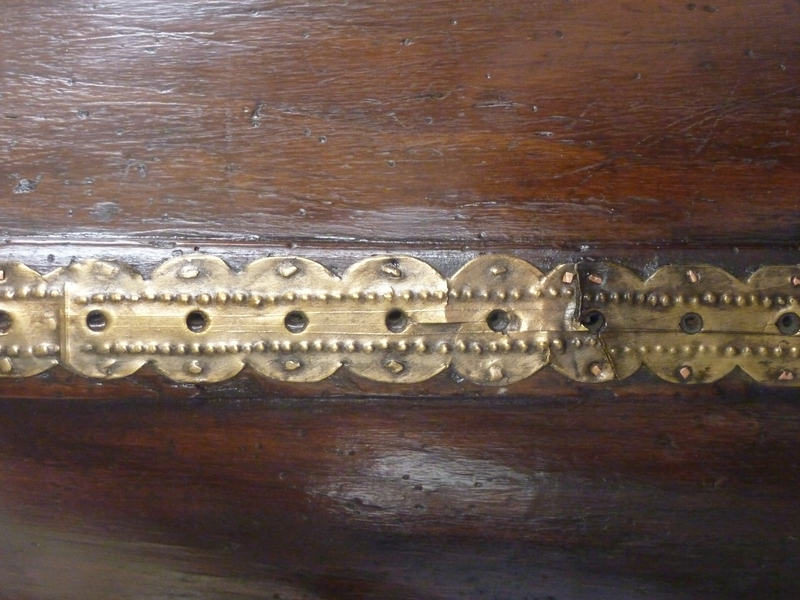 Looking at recent photos of the harp, these nail holes are visible in the indentations in the later metal strip. My guess seems to be correct, that the wood holes are slightly wider spaced than the metal holes. I can see the nail holes for wood hole 2, about 3/4 of the way from metal hole 2 to metal hole 1. Assuming that the nail holes are aligned with the string holes gives us a positive and confident way to locate the hidden string holes in the treble of this harp. 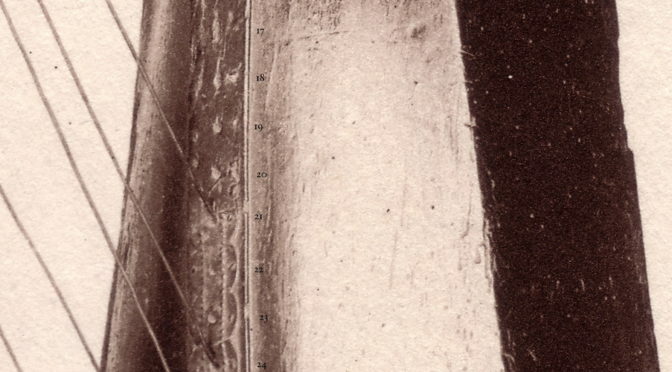 The nail holes visible in Armstrong’s photos also prove that the metal strip, which is currently on the harp from the treble down as far as position 21, is not the original metal strip. The original strip was nailed on with a nail each side of every string hole (as we see in the extant strip in the bass below position 22), but the strip on the harp above 21 now has only fake nails, and no holes. So it looks like that metal strip from position 21 up may be a 20th century fake. X-ray fluorescence analysis would allow measurement of the alloy composition to see if the metal is characteristic of modern or historical brass. Paul Dooley read my blog post and made some useful comments. He says that he is fairly sure there is an extra hole at the bottom end of the inserted strip, and so I have added this supposed hole to my drawing, and numbered it 9. Of course that means that my previous numbering from 2 to 9 has had to be edited to read 1 to 8. If anything, this confuses me more, because the pair of long nails lined up with metal hole 10, clearly emerge inside the soundbox lined up in between wood holes 10 and 11; but the long nail beside metal hole 6 clearly emerges lined up between wood holes 5 and 6. Paul wondered if the inserted strip was a very poor repair, not preserving the original hole positions; I think he may be right. He also casts doubt on my identifying the brass knobs along the upper length of strip as fake nails; they may be actual brass nail heads. This needs confirmed one way or the other in real life, as I cannot tell from photos. I reverted my 7th June 2018 edit, back to the diagram and text as posted originally. I have re-checked all the photos and I don’t believe Paul is correct. On the other hand I think the inserted repair strip is longer than I have drawn, possibly right up to the top of the soundbox. I think all of the treble holes from 9 up are placed perhaps 1cm too high on the box. Again it is impossible to be sure without proper documentation. I still have lots of questions about this. I checked the brass knobs on the upper part of the strip in August; I am pretty sure they are not nails, but are embossed into the strip, kind of like fake nails.